It had begun to look like the English weather conspired against the Wigan Group Bowling Tournament, with the occasion being blighted by inclement conditions in past years, with howling winds adding the excitement of last year’s proceedings, making it a test of perseverance as well as bowling skills. This year however the venue, Highfield Bowling Club, was bathed in sunshine and the conditions perfect. So it was a dry, quick and at times, a quirky green that tested the participants and some fine bowling was witnessed by all present. The winner was John Bimpson, of Holmes Lodge No 2708, who beat last year’s winner John Cooper, of Willows Lodge No 5343, by a very narrow margin. It was a final where we discovered that brotherly love is more valuable than ‘the town hall clock’. It was eagerly watched by all the other participants and John Cooper didn’t release his grip on the trophy lightly. 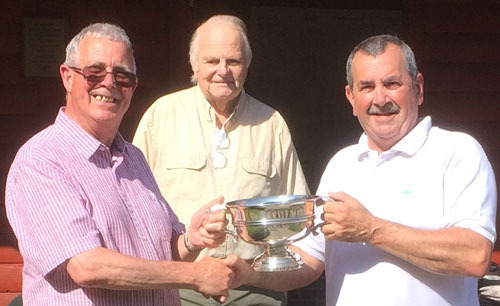 The losing semi-finalists were Peter Schofield of Corinthian Chapter No 2350 and Joe Warminger of Willows Lodge. Presenting the trophies was president and group chairman Geoffrey Porter who had watched the games with close interest. He warmly thanked all the participants for their attendance and support of the event. He also thanked Denis Bruen and Bill Wilding for lending their support to the event even though neither are fit to play due to medical problems. Geoffrey congratulates runner up and defending champion John Cooper closely watched by Len. Denis is recovering from a very serious road incident last year when, as a pedestrian, he was knocked down and suffered severe injuries and Bill is awaiting a hip replacement. Both were in good spirits and the president expressed his pleasure at sharing part of the afternoon with them. Bill’s wife, Julie, was thanked for convincing the brethren to purchase tickets for a raffle. All the brethren present were reminded to remember those brethren who were no longer able to be with us at this event and anyone else we miss so much. Geoffrey Porter made special thanks to Len Hart and the committee not only for their organisation of this event but also for their work throughout the year and to Len’s wife Mary, though not present on this occasion, for her involvement too. It was again, a thoroughly enjoyable afternoon, with some very good bowling and some extremely closely-fought matches. 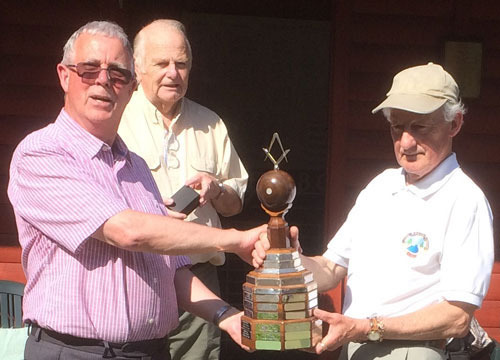 The Wigan Group Masonic Bowling Trophy has a new name on it – John Bimpson. Well done John. The winner, runner-up and losing semi-finalists will represent the Wigan Group at the West Lancashire Provincial finals to be held in Fleetwood later in the summer. Some of the competitors at the tournament.